MinRex Resources Limited (ASX:MRR) has today informed the market that the final requisite conditions precedent to the settlement of its East Pilbara Tenements have been given key shareholder approval and are expected to be completed in the near future. Rock chip samples taken from the tenements, collected prior to Christmas, have now been delivered to the lab in Perth for assaying. In anticipation of the pending settlement of the East Pilbara tenements, an initial program of works is currently being finalised by MRR — the program covers the work to be undertaken at the tenements as soon as it gets the green light. Earlier this month, the company released an update, including news of six gold nugget discoveries (22.7 grams) and a site inspection of its to-be-acquired projects. MRR also welcomed Artemis Resources (ASX:ARV) to its shareholder register. 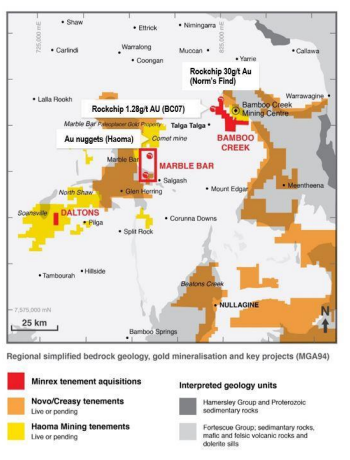 Another potentially significant factor MRR is closely monitoring is the tenements’ close proximity to gold occurrences on the adjacent Haoma Mining (ASX:HAO) tenements, which puts much of MRR’s exploration work along strike from HAO. They also border licences controlled by the $475.4 million capped Novo Resources Corp (TSX-V:NVO). In good news for Pilbara gold stocks, Novo recently gave a presentation at a Canadian mining conference which led to a 25 per cent uplift on the Canadian Stock Exchange. Whilst Pilbara stocks have seen a slight downturn recently, the tide looks to be turning and MRR is seeking to capitalise as they look to release news around assay rock chips from 2017 due diligence field evaluation, historical data compilation, target generation, mapping, surface sampling, prospecting and drilling depending on results. Boutique investment bank, EverBlu Capital, has published its extensive research report on junior gold explorer MinRex Resources (ASX:MRR). The 16 page report, which provides an in-depth exploration of MRR’s growing portfolio, has rated MRR as a ‘speculative buy’ with a price target of A$0.31. EverBlu’s price target assumes successful exploration efforts and 77.1 million MRR shares on issue. The report comes on the back of significant investor interest in Western Australia’s Pilbara Region, due to several gold discoveries over the past year. 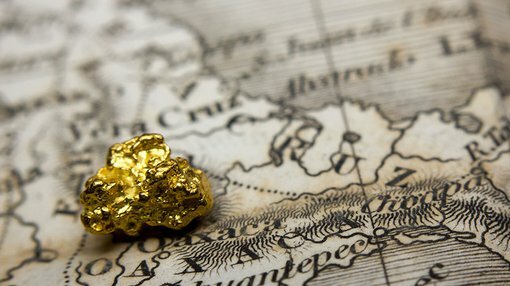 Initial interest was sparked by the aforementioned Novo Resources, which found small watermelon seed-shaped gold nuggets at Artemis Resources’ (ASX:ARV) Purdy’s Reward prospect as part of an exploration joint venture. 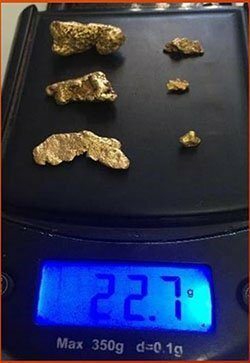 Several explorers are now in the process of testing the two proposed geological models for the region: conglomerate-hosted gold and high grade orogenic gold. Since listing on the ASX in 2011, MRR has aggressively expanded its tenement holding. The company acquired a 70% interest in five highly prospective licenses in the East Pilbara region last November, which are prospective for gold as well as copper, lead and nickel. As part of the deal, MRR paid a non-refundable deposit of A$100,000 on execution of the Heads of Agreement. The company will make a further cash payment of A$650,000 and issue 14,583,334 fully paid ordinary shares at $0.12 per share to the Vendors upon settlement of the acquisition. During the private placement held to facilitate the acquisition, Artemis Resources (ASX:ARV) secured a A$250,000 strategic stake in MRR, which ensures the company’s involvement in any developments involving the tenements moving forward. These new licenses are located within three projects: Bamboo Creek, Marble Bar and Daltons. Of particular interest is the Bamboo Creek project, which has returned historical rock chip samples of 30g/t gold at Norm’s Find.